Soo Co-op Credit Union makes it easy and convenient for members to access their money and avoid annoying surcharge fees that add up quickly. Bingham Branch - 536 Bingham Ave.
Dondee Lanes - 3162 S. Mackinac Tr. Moloney's Alley - 227 W. Portage Ave.
Kewadin Casino - 2186 Shunk Rd. LSSU Norris Center - 650 Meridian St.
Midjim - 2205 Shunk Rd. Sault Area High School - 904 Marquette Ave.
Bay Mills Resort & Casino (2) - 11386 W. Lakeshore Dr.
King’s Club Casino - 12140 W. Lakeshore Dr. Cozy Inn - 10015 W. Lakeshore Dr.
Back Bay Grill & Game - 11386 W. Lakeshore Dr.
Wild Bluff Club House - 11335 W. Lakeshore Dr.
Bay Mills Community College - 12214 W. Lakeshore Dr.
Pickle's Restaurant - 11204 W. Lakeshore Dr.
Islander Bar - 134 S. Pickford Ave.
Pickford Co-op Food Pride - 130 Pleasant St.
Download Co-op's Mobile App to your phone and have access to 30,000 surcharge-free ATM locations nationwide. Surcharge-free access to your money, almost anywhere. 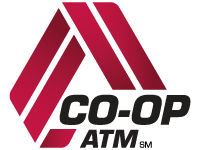 CO-OP's nearly 30,000 ATMS mean you have access to your SCCU account where ever you may be.